Grooming your pet can be therapeutic or a struggle, depending upon the mood and naughtiness of your buddy. But we cannot overlook the fact that most dogs aren’t very keen on being groomed, which makes the process a tad bit difficult. Not all dogs are scared of groomers, but for some it may be a cause of huge stress. From mild anxiety and trembling to incessant whining and panic attacks, a scared dog can exhibit a variety of symptoms. By the end of the grooming process, the dog looks great, but psychologically he feels scarred and traumatised. Even when the symptoms might seem less worrisome, it is important that preventive measures be taken to address dog’s grooming related anxiety before it progresses into full-blown aggression. There could be many reasons behind a dog’s seemingly inexplicable dread of grooming. These need to be carefully considered by pet parents so that the fear can be addressed effectively. The presence of any sort of infection or pain can make an otherwise calm dog irritated upon being touched. Therefore, a sudden change in a dog’s temperament with regard to grooming warrants a trip to the vet. Changing groomers frequently can also affect a dog’s behaviour. Just like humans, dogs also need time and space to adjust to changes, especially if it concerns people handling them. Incorrect handling can make dogs wary of grooming. Some groomers/grooming assistants might be careless while handling them. It is important to find a grooming professional who understands the importance of gentle handling to make the whole process comfortable. Lack of proper training and exposure to grooming during puppyhood can make an adult dog fearful of grooming. Puppies who are trained to become used to grooming are often easier to groom as adult dogs. Pet parents should get their puppies used to being brushed and lifted at home regularly. Gradually introduce them to being brushed and lifted by friends so that they get familiar with being handled by strangers. The same procedure is applicable to adult dogs as well. 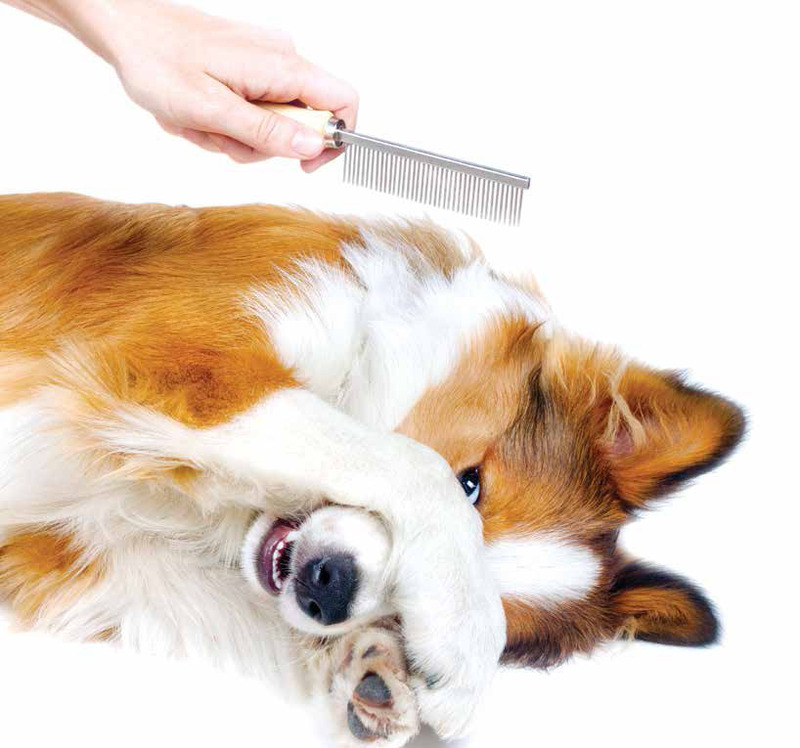 Sensitive areas of a dog such as the paws, eyes, ears, tail, muzzle and groin are often handled during grooming. Therefore, it is imperative to make the dog comfortable with being touched, especially on his sensitive spots. Pairing predictor words with specific body parts, for example, say ‘ears’ and gently touching the dog on his ears, should immediately be followed by a reward or treat. This conditions the dog to view grooming as a rewarding process. Gradual progression should be made from touching the less sensitive areas to more sensitive ones. This type of training should not be too lengthy or forced. Rather, it should be continued only when the dog is in a relaxed state. Car rides can make some dogs stressful. A dog who reaches the groomer’s salon in an anxious state can be challenging to handle. Therefore, it is important to get the dog used to car rides by associating the ride with a reward such as a favourite treat of theirs. Grooming does not ‘have to’ be done a certain way. 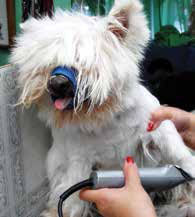 Grooming procedures can be tweaked to suit the dog’s comfort level. Aspects of grooming found unpleasant by the dog can be substituted with more comfortable alternatives. For example, if being lifted onto the grooming table frightens the dog, makeshift stairs can be placed to let him climb up on his own. Likewise, a dampened cloth can be used as an alternative to running water to soothe a hydrophobic dog. Muzzling can be used as an option for a fearful or aggressive dog. It makes the grooming process safe for the groomer as well as the dog. A treat can be smeared inside the muzzle in order to coax the dog to willingly put his nose inside it. A muzzle usually eliminates the need for other types of restraints as well. Desensitisation reduces the dog’s fear through extremely gradual exposure to the stressor. This process involves a series of ‘pleasant’ visits to the groomer with little or no grooming involved. Such visits accustom the dog to the unfamiliar sights, sounds and scents of the groomer’s parlour without subjecting them to overwhelming stress. This process aims at changing the dog’s emotional response towards grooming. For instance, if the dog hates the dryer and the sight of it makes him tremble, counter-conditioning will make him love the dryer and be happy at its sighting. Here’s how to go about it – Pet parents should start by gradually introducing the dryer to their pets. You can place it in the middle of the room in order to allow him to examine and sniff it himself. Keep some treats handy. When your pet takes the initiative to sniff or examine the dryer, reward him with a treat. Try removing the dryer and treats together from his line of sight. This would help him establish a connection between the two. Repeat this process a couple of times during the day. Eventually your pet will learn to associate the dryer with treats positively. The mere sight of the dryer will make him drool in anticipation! This method can be progressed systematically by taking the dryer out, blowing it over the dog’s body and putting it back in. The process should be immediately followed by a treat. Repeat it for a few days and he’ll understand that getting blow dried will lead to his favourite treats. Working on modifying their behaviour takes longer but works on the underlying problem. 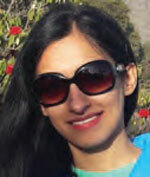 It is a much better alternative than administering sedative drugs that can cause side effects. Natural herb-based sprays and oils such as Lavender and Chamomile often have a soothing effect on dogs. Pheromones collars and sprays are even more advantageous, as they trigger primal memories of their nursing mothers and reduce stress. The breaks can be lengthy ones – involving taking him outside for a brief change of scenery or short ones – which simply involve putting down the grooming tools for a few minutes and giving him some breathing space. If during this time, he sniffs the grooming table, lets out a big yawn, shakes off or scratches himself; you should know that he’s trying to diffuse his stress. Dogs always try to avoid conflict, thus must be given some time to engage in diffusing behaviours. Growling is a form of canine communication, just like barking or whining. In the stressful grooming scenario, growling is usually indicative of the dog’s last attempt to communicate before a bite. It is a warning system that has been put in place by nature to indicate that the dog is feeling threatened and is likely to get aggressive if the threat is not removed. Pet parents must never punish a dog for growling. Pet parents must take care to never forcefully suppress their pet’s behaviours. Forcing him to stay quiet while being brushed by yelling at him, or using a threatening tone will not cure your pet’s anxiety and fear. Focus on finding and eradicating the root cause of the fear through the use of patience, love, repetition and consistency. Getting a dog to eat something requires the dog to relax, even if it is for a few seconds. Meat based treats that need to be licked off a spoon require the dog to relax for a few minutes at a stretch. This brief window allows the dog to relax, look around and diffuse his stress. Unwillingness to eat treats is indicative of high levels of stress in a dog. Playing calming music will engage your pet’s auditory senses and distract him from the grooming procedure. It’ll be soothing and relaxing for him. 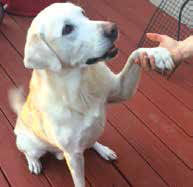 Dogs in a relaxed frame of mind will readily respond to cues they know like – sit, shake hand, kneel, etc. It is something they know and hence find familiar. It is normal to see them do a ‘shake off’ or yawn after doing a few familiar cues – an indicator of diffusion of stress. A frozen response when asked to do something he knows is indicative of stress and not stubbornness. Just like a scared human of any age can find it difficult to follow directions, so can a dog. If your pet is too scared or gets extremely anxious, then you can opt for grooming techniques at home. Or you could also ask for home visits by professional groomers. This would spare him some stress. But try to make your pet familiar with the process. With some encouragement and treats, it can be achieved.